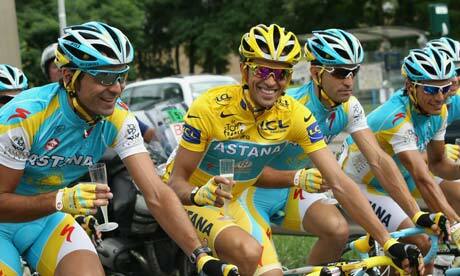 The Tour de France concluded today with Spaniard Alberto Contador claiming his third yellow jersey. What irks me about this daunting bike race is that the final stage is nothing more than a closing ceremony. Any doubt in this race – any year not just the 2010 edition – is always determined in the 17-19 stages, never the 20th. Although I respect the sentiment of allowing the final stage to be a victory lap, my competitive instincts tell me otherwise. If it was up to me, tradition would be bucked and Alberto Contador would have been beaten in today’s final stage. The Tour shows its true French colors with this practice. As it does with group times – that is if a group of bikers, say 20 or so, finish together they all receive the same time. I say fooey. If you don’t finish at the front you don’t deserve that time it is the American way. You should earn your time, not just a place in the group. I realize with the amount of racers figuring out individual times would be quite difficult. But, nevertheless, it figures that the host country is known for surrendering so they make sure everyone gets a fair shake. I don’t care about the final stage. If I am withing striking distance, like Andy Schleck was today, I would give everything I had to make up the 40 seconds necessary to win the trophy. Why wouldn’t you want the added drama with the final stage. It is the same as overtime, game seven, a full count and penalty kicks. It is good television and it is better competition. You should bring out the best in everyone, not free passes. Maybe you would upset some people, so what? Sports are about giving 110% and not calling it quits. This sport says you’re not allowed to try your hardest in the final moments because the guy who is going to win should get a freebie. If Contador is such a great competitor then he would welcome such a challenge. Hell, these guys climb insane mountain roads in this race, whats so hard about a flat stage through Paris? I am going to speak for someone I don’t know and have never met. But, judging by what he has been through and accomplished, I’m sure Lance Armstrong would be ok with being pushed in the final stage. He is an all-out competitor and I am sure he would want to be pushed until his breaking point. Maybe he wouldn’t though, I can’t be sure. But, either way, it is a shame that this race’s final stage is conceded to the rider in yellow, particularly when the gap was only 39 seconds. With this tour also came the end to Armstrong’s career. Unfortunately, he was unable to compete with the leaders this year, thanks to some untimely crashes. While I don’t know the strategy of the Tour well enough, I had to wonder how hard it would have been to get him back into contention. I don’t mean he needed to go out and win a bunch of stages. But, if he and the RadioShack team were to have gone out and chipped away at the time he trailed by before they reached the Pyrenees, Armstrong’s scary climbing skills may have gotten him up in the top five or ten. Of course, this is me speculating, I truly am rather ignorant when it comes to the science that is the strategy in winning the Tour. However, I love that Armstrong won seven-straight times. I admire his charity work and what he came back from. I hope the doping allegations go away. Floyd Landis is attempting to bring everyone down with his sinking ship. I personally don’t want to know if anything happened. It is in the past now, I don’t think Armstrong doped, but I can’t be 100% sure. Either way, he is walking away from the sport, he should be left alone by all of this nonsense so the incredible legacy he cast remains untarnished. The USA is back atop the world of outdoor lacrosse after defeating Canada 12-10 yesterday in Manchester, England. Finding any sort of media on the game took quite a bit of work. ESPN ran the game today on tape delay, I’m pretty sure someone turned their MacBook to face the field and used PhotoBooth to record the game, that is how awesome (sarcasm) the video quality was. But, the US won. Even with a questionable roster, in my opinion, the US managed to reclaim the world title. I personally thought the defense and goaltending were below par, particularly compared to Canada’s defense, and I thought we would need to outscore our neighbors to the north to win the championship. That is pretty much how it went. Ned Crotty scored an incredible goal that wound up being the winner while Paul Rabil and Mike Levielle each had a hat trick. How ’bout those sick gloves too? What is even better is that our unis didn’t look like the Canadian’s. The Canucks weren’t helped by the fact that John Grant Jr. (not in picture) decided to wear a Reebok hockey helmet instead of a traditional outdoor bucket. Seeing that the USA didn’t roll out in those super ugly uniforms really made the victory that much better. I hate that this tournament was played overseas. I understand this game needs to grow on an international level. But, you will get the best TV coverage and fan turnout in North America. The sport is far too fledgling internationally to justify moving the tournament all over. The FIL should learn their lesson on this one and keep stateside with this awesome tournament. Previous Article Is Buffalo seriously this cursed?